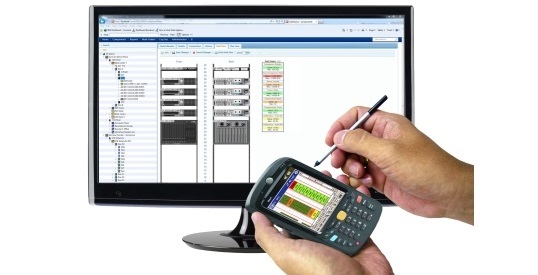 Whether you need to record the Plate value, Actual Power utilisation, Equipment Weight or any other attribute in the system, Cormant-CS uses a familiar interface to enable an organisation to show a current snapshot, or automatically updating graphical views of your existing and future capacity. Many organisations have been able to recover many unused data ports/outlets from their infrastructure which has negated the need to either purchase further switches, or switch blades, or patch cables. By having a database to centrally manage your infrastructure, you are able to better utilise your active and non-active equipment and ultimately save money. Through the football fields’ view, organisations are able to show the current power utilisation of the entire Data Centre, or any space within the organisation. Cormant-CS has the ability to be able to show almost any information in a football field view. 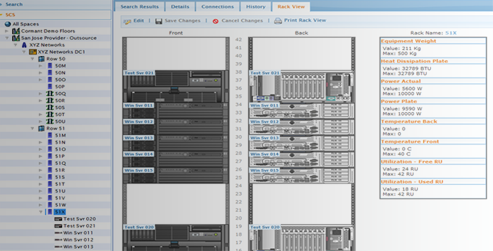 Information such as Rack Units Used, or Rack Units Free can be displayed to give an instant snap-shot view of your organisation. Together with the ability to ‘Historically Log’ any attribute, Cormant-CS is able to show you the growth of your organisation over time, which can be useful for planning expansion, whether that be in physical space, power consumption or structural integrity (due to weight constraints) of your Data Centre. The same issue of free ports on Patch Panels exists in many organisations. By having a system with accurate records, you will be able to recover any un-used patch cords and fee up valuable patch panels for your racks, floor outlets and any patching frame in your organisation. Cormant-CS has the ability to obtain and store any information that is available on a device via SNMP and WMI. Many of today’s devices broadcast information over the management network, including what their current power utilisation is. By obtaining this information, Cormant-CS can historically store the current value against the relevant component in the system. Moreover, Cormant-CS can be setup to automatically obtain the value at a regular time frame (e.g. every 5 minutes), thus producing a regular record of what power was consumed by the device over a day, week, or months. Many organisations are under-utilising their switches due to not knowing what ports are actually ‘free’ on a switch. Common practises of connecting to a switch and performing a ‘show port’ to see what is connected does not accurately reflect if the port can be re-used. With a Cormant-CS solution, having your entire infrastructure recorded allows organisations have 100% accuracy of your switch port capacity. Many organisations have deployed IP based power rails over the past few years. Cormant-CS is able to read the SNMP information from these devices and use it to record and display the informaiton directly in the database. Even if you have not purchased the IP Power Rail management software, Cormant-CS can still obtain the readings and store the data historically for you. This ability allows you to produce charts of current and past readings, and can be used to provide easily created management reports for your internal or external clients, which in turn, can be used to charge for actual power usage, vs. estimated readings. 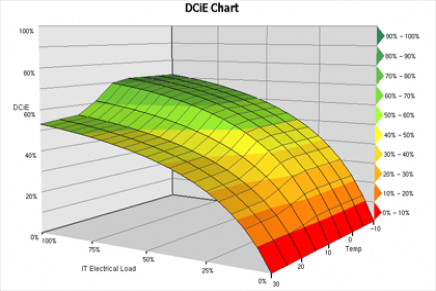 What is DCIM + ? Data Centre Infrastructure Management (DCIM) is a relatively new term that represents an emerging class of solutions to record, control and monitor IT physical infrastructure. Gartner predicts that it will quickly grow from 1% penetration of data centres in 2010 to 60% in 2014 (DCIM: Going Beyond IT, Gartner Research, March 2010). Cormant-CS has been on the Global market for over 12 years, providing the best connectivity platform on the market and an advanced and comprehensive DCIM solutions for our customers. We like to think that we provide more than the standard DCIM solution, and as such, are pleased to offer our customer DCIM Plus!